Make a statement with a high quality Autogeek acrylic tag! The Autogeek Lazer-Tag License Plate was custom made just for us, and each plate is laser-cut and hand inlaid with the Autogeek logo in vibrant colors! Choose from different colors and finishes to perfectly complement your vehicle. Show your inner Autogeek with this attractive and durable acrylic license plate! Each piece of the logo is cut from reflective, mirrored acrylic so the colors really pop under sunlight. The black background is available in a flat finish or in a mirror finish. 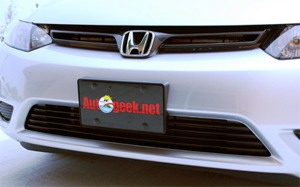 The Autogeek Acrylic License Plate is available in two sizes: a standard plate or a half plate. The standard plate is 12 X 6 inches and has four mounting holes. This the same size as any U.S. license plate. This size is a perfect fit for vehicles with a pre-existing space in the bumper for such a plate. Choose from a flat black finish or a black mirror finish. The standard black plate is shown here. The half plate measures 12 x 4 inches. It has only the two top mounting holes. This size offers a sleek, modern look to any vehicle. The half plate is also available in a flat black finish or a black mirror finish. Several staffersï¿½ vehicles are already sporting the plates and they look great! The mirrored logo really sparkles in the Florida sunshine. The variety of colors in the logo and the black background complement any vehicle color. On both the black and the mirror plates, our Autogeek is cut from mirrored acrylic. Made from thick acrylic, these plates are nearly indestructible! They will stand up to your daily commute. Use Diamondite Plasti-Care to clean and protect your Autogeek plate every time your detail your vehicle. 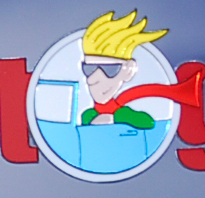 The Autogeek Lazer-Tag License Plate will require mounting screws. Choose the EDI Plate Fasteners to fit your make and model. If your vehicle requires a mounting bracket, use the EDI H-Bracket Universal Mounting Kit. It works with any vehicle and includes all the hardware you need.